Write Snap Scrap: A Twine Birthday Giveaway! The design team at Trendy Twine has a little something up its sleeve today: a surprise birthday party for Lesley, the owner. Today is her big day and to celebrate, we've each made birthday cards for her, which we mailed earlier this week. Each team member is spotlighting Lesley's card on our blogs today. This is the card I made. I tied a bit of Twisted Lime twine around the chipboard vase then curled it for a decorative effect. To curl the twine, I wet the twine with a glue medium and rolled it around a toothpick to dry. When I removed the toothpick, the twine held its curlicue shape. The team invites you to join the party with a hop to each blog. You'll find lots of great tips with twine along the way and a few prizes too. The next stop on the hop is Jamie. 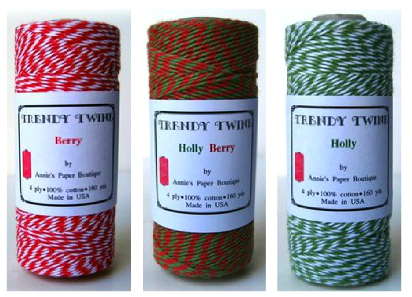 If you get lost, just pop over to the Trendy Twine blog for the full lineup. The prize on this stop is 20 yards of holiday twine. You'll get 5 yards each of the holiday colors: Berry, Holly and Holly Berry plus 5 yards of Orange Truffle which we are featuring this month (not pictured). To enter the drawing, follow this blog and leave a comment here on this post by 9 pm EST on Tuesday, Nov. 20. A winner will be chosen by random.org and posted here on Wednesday, Nov. 21.
beautiful card Izzy, love all the little details & colors! Such a pretty card! 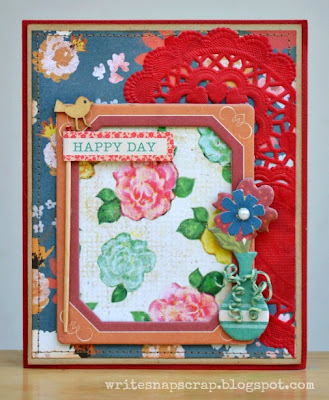 I love how you used the red doily- it makes the card just pop! 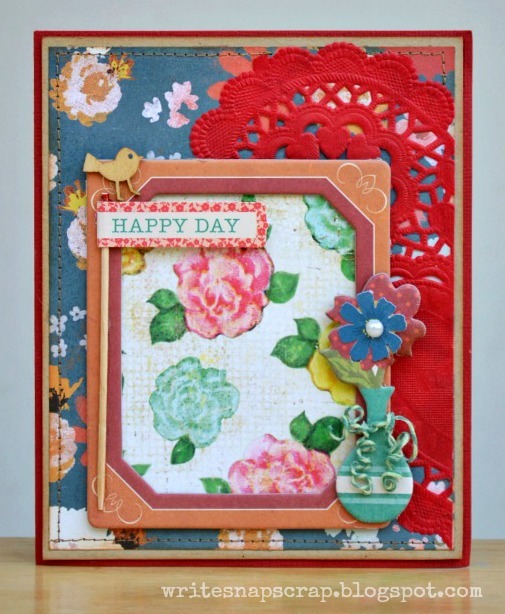 Aren't you so sweet and thoughtful to celebrate Lesley, and to make her such a beautiful card, on her special day! :) It was so nice of you to put your time into this, Izzy. Love how you curled the twine! Your card is Stunning. I love the primary colors and vintage feel. Great job my friend! Super card! I love that red doily ! Love the flowers and you always make the cutest curlies. Such a sweet surprise today. Thanks, Izzy, for making my birthday so special. Such a lovely card! The flowers have brightened my day - and Lesley's too - especially since here, the snow is falling...falling. The little twine curlique on the vase is such a special touch. Thank you for sharing and inspiring. Happy Birthday to her and what a cute card. LOVE the little twine accent. OK...I have to say that this is a clever idea to use your twine but then again you're a clever gal! LOL! Love it! love the curlies of the twine~great look!! Love twine!!! Oh wow, I love this! I'm totally going to try curling some twine! The red doily is gorgeous too! Thanks for the chance to win some twine. I've got lots of giveaways going on on my blog too at the moment, as part of my Frosty Festivities Blog Event! Pretty card! Love all the layering and the doily! Such a cute card...and curling the twine was so smart! Love it! Beautiful card! Love the twine on it. 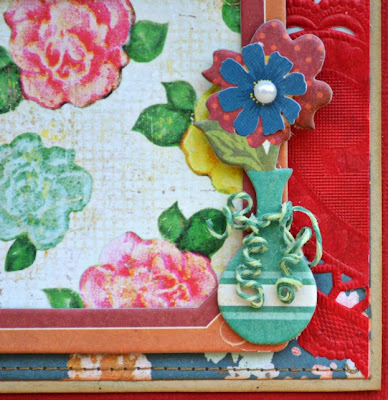 Love the flower patterned papers and the trick with the glue and the twine. I love how you used the twine! Beautiful card! Beautiful the touch of twine is perfect! Just beautiful. Love the colors in the papers. Love the curled twine wrapped around the sweet vase! What an awesome way to use the twine! Will have to give this a try! I'm a new follower! I love the way you used the twine! I'll have to remember that tip.